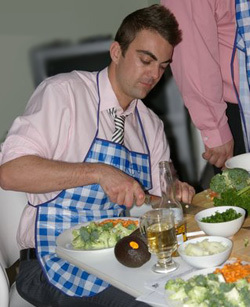 Team building cooking classes are a great way to inspire your teams, clients or conference delegates. In any organisation it’s essential that communication and relationships between employees contribute towards increased productivity, and not the opposite. Corporate cooking classes are facilitated in a relaxed, informal environment that fosters collaboration and the natural development of positive connections between staff. This activity serves as a powerful metaphor for the participant’s daily work challenges. The team is able to prove to themselves that through co-operation, communication, planning and time management they are able to succeed in overcoming a challenging exercise. As an added bonus they prove to themselves that it can be loads of fun! Team members also have the opportunity to see another personal, likeable side of their colleagues. This engenders greater optimism about their work, opening up another dimension to their relationship and allowing work to become more enjoyable. Participants return to workplaces feeling enthusiastic and motivated to duplicate their successful group activity experience. We guarantee that staff will come back to work with a high level of morale and feel more positive about their employer. When your staff deserve a reward, giving them a corporate cooking event not only rewards your staff, but also benefits the organisation through increased productivity and higher staff retention. Your team will learn new skills to communicate and co-operate better, as well as feel inspired and motivated. We are finding that some employers look to generate even greater return on investment from corporate cooking classes by adding an evaluation layer to the process. Some organisations are even using it as part of the evaluation process for selecting graduates. Our corporate cooking classes can be structured to focus on specific staff outcomes or to simply get everyone together for a fun time. We include a full meal with your Team Building Cooking Workshop, which you’ll prepare! We can provide a range of menu options to suit your budget, so contact us today for menu requests and suggestions. The recipes used in our corporate cooking workshops have been carefully selected to teach participants how they can make healthier meals that also taste delicious! It’s an indoor team building activity and therefore you’re not at the mercy of the weather! Venue, transportation and drinks aren’t included in our standard packages, but we can organise all that for you upon request. Locations we cater for corporate cooking events include Sydney, Melbourne, Brisbane, Adelaide, Perth, Canberra, Hobart, Newcastle and Wollongong. Please contact us on 1300 889 073 or email us to discuss how we can tailor team building cooking classes to suit the needs and budget of your company. With a high end health focus, we came together to prepare a feast which was healthy to eat, easy to prepare and gave instruction for replicating the menu success again." Here is a detailed case study of the team cooking class we did at GN Netcom.